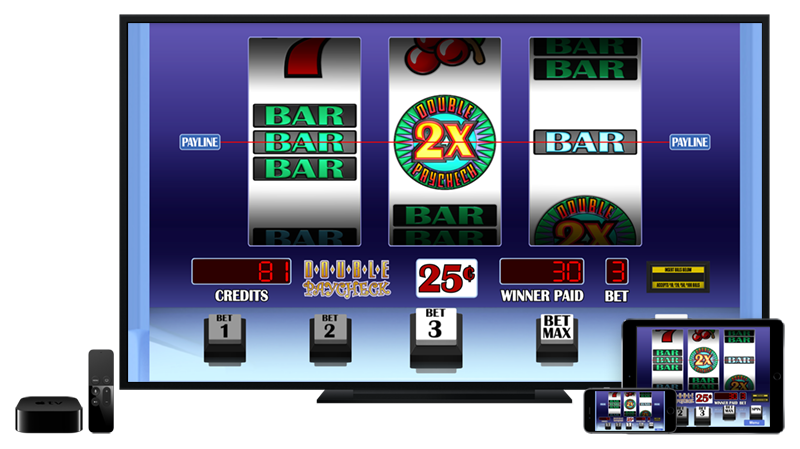 Arcadia Slots HD – now available for Apple TV along in addition to iPhone, iPad and iPod. Win 2 to 5,000 credits – Wild! symbol matches any other symbol on the payline. Hit three Wild! symbols in a row to win the Jackpot. Win up to 10,000 credits – ‘Double’ symbol matches any other symbol on the payline, and doubles your payout. Two Doubles on the same payline quadruple your payout! Hit three ‘Double’ symbols in a row to win the 10K Jackpot. 17 different ways to hit a winning payline, from any three different symbols of the same color, to three ‘Wild!’ symbols in a row. Any combination of a Gold, Silver, and Bronze symbol in order gives an even bigger win. Hit the jackpot for 5,000 credits! Wilds not only matchany symbol on the payline, it doubles the winning payout too! Hit two ‘Double’ symbols on the payline, and your winning combination is quadrupled! Win up to 2,500 credits in one spin! 10,000 credit jackpot – the ‘Double Jackpot’ Wild doubles all winning pay lines. Two Doubles on the same payline multiply your win by 4X! See if you can hit those Lucky Sevens! We can’t triple your paycheck, but we can triple your wins, or even multiply your winning payout by 9X! Bars, Sevens, and Triple bonus multiplier. Double Gold Silver & Bronze. Similar to Wild Gold Silver & Bronze, but with bonus multipliers. Double or even quadruple your winning paylines, and a jackpot work 4,000 credits! Cherries, Bars, Sevens and a Five Times multiplier that stacks with your winning payouts. Get two ‘5X’ symbols on the same line, and increase your win 25X!